What’s The Best Granite Cleaner For My Countertops? When your granite countertops were installed, your contractor may have provided instructions for cleaning granite. The best granite cleaner for your new tops is NOT glass cleaner, ammonia or even dishwashing soap. See the guide How To Properly Clean Granite Countertops. You should clean your counters daily using MB-5 or GT-1, both granite cleaners made for stone. 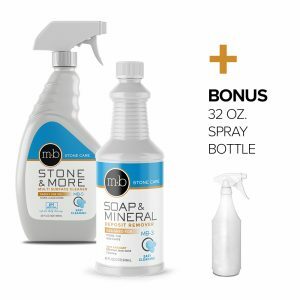 The best performing product we’ve found for cleaning granite is MB-5 Marble, Granite and More Spray Cleaner from MB Stone Care. You can clean your granite and natural stone counters daily with MB-5. In cooking and eating areas, use it full strength. In less used areas, you can dilute in a proportion of 1:1 with water. If you’re concerned about disinfecting areas where you handle meat, try MB-15 Stone Cleaner/Disinfectant from MB Stone or check out UV light wands available for disinfecting countertops. See Disinfecting Granite with UV Light. MB-5 is proven to quickly and easily clean marble, granite countertops, ceramic, porcelain, glass, and most other hard surfaces. It can also be used on mirrors and bath and kitchen fixtures. It is not meant to clean heavily soiled areas or soap build-up (use MB-3 soap film remover for these areas). EPA certified “Green” granite cleaner GT-1 Natural Stone & All Surfaces Daily Cleaner from MB Stone Care is a neutral pH, ready-to-use, EPA Certified “Green” cleaner, formulated to be environmentally compatible and sustainable. GT-1 safely and easily cleans honed or polished marble, granite, limestone, slate, travertine, Corian, ceramic, porcelain, laminate and also painted wall surfaces. Works great on windows, mirrors, and shiny metal fixtures too. This fast evaporating, powerful, daily cleaner works quickly and cuts through soils on all hard surfaces. It’s streak free and dries quickly. Clean your granite countertops daily with the best granite cleaner that’s environmentally friendly and made specifically for natural stone. If you clean your granite or other natural stone countertops daily with dish soap, you’re bound to get a soap film build-up on your tops. Your countertops will be dull and lose their shine. Restore dull granite countertops with MB-3 Soap Film & Mineral Deposit Remover removes not only soap film but also soap scum and hard water deposits on granite, marble, limestone, and other natural stone countertops. Works well on quartz too. Use MB-3 in the bathroom to remove build-up on stone shower walls and floors. Remove those tough hard water deposits on glass shower doors. MB-3 is a non-acid cleaner that quickly dissolves and then removes soap film. It achieves effortlessly what ordinary household cleaners or abrasives can’t achieve even with hard scrubbing. The same great professional grade sealer, daily cleaner, and soap film remover that we recommend combined into kits. Major cost savings plus free shipping! Unlike silicon sealers, MB-4 will not evaporate or go through any type of natural deterioration. MB-4 will prevent liquids from being absorbed by all natural stones. MB-5 Marble Granite and More Spray Cleaner is your daily cleaner for natural stone including granite countertops. Effortlessly and effectively clean your stone countertops without leaving any streaks. It’s the best granite cleaner you can use. MB-3 Soap Film & Mineral Deposit Remover removes not only soap film but also soap scum and hard water deposits on all natural stone surfaces. Welcome to Rare Earth Stone Products, your source for the best performing natural stone care products. We started as a granite countertop manufacturing and installation company over 12 years ago. Installing thousands of countertops, we discovered MB Stone Care granite sealer and cleaner products. MB Stone Care products are quite different from others and experience has shown us they are the best choice to protect your granite and stone countertop investment. Every countertop we installed was sealed with MB Stone Granite Sealer and we provided each customer with ongoing care products from MB Stone. Thanks for your trust. Questions – Contact Scott @ Granite Care Pro. What’s The Best Granite Sealer For My Countertops?